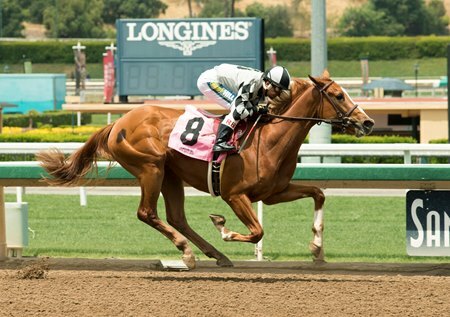 Arcadia, CA (May 17, 2018)-Tommy Town Thoroughbreds’ homebred Six Pack Gal was the first starter and first winner for the stable’s freshman sire Boisterous when she rolled to an impressive debut score at Santa Anita Park May 17. Facing seven other juvenile fillies in the 4 1/2-furlong maiden special weight, Six Pack Gal broke behind Derby Luck, Rolinga, and Swing Thoughts, but rushed up on the outside to grab the early lead. She clicked off fractions of :23.08 and :47.18 through the first half-mile, then opened up through the stretch to win by 3 1/2 lengths in a final time of :53.38 over the fast main track. The California-bred filly is out of the Forest Camp mare Heart Six, who has also produced stakes-placed Light Up the Sky and four other winners from seven foals to race. A son of Distorted Humor, Boisterous was a grade 1 winner on the turf, winning the 2013 Man o’ War Stakes (G1T). Racing from age 3 to 7, he accumulated seven victories and seven placings from 23 graded efforts. He retired with a record of 12-3-4 from 35 starts and $1,458,792 in earnings. Boisterous, who is from the family of grade 1 winner Gold Fever, stands at Tommy Town Thoroughbreds for a fee of $5,000.